My brother Chuck took this beautiful photo of Alaska’s splash of autumn color announcing a new season; may it be your best. Before we go any further, yes, I know that I spelled the word “respect” incorrectly. I suppose I wanted to emphasize that many of those serving in this President’s administration are seemingly cut from the same cloth. When I read the following entry on Chuck Heath, Jr.’s Facebook page, I must confess that I felt a range of emotions starting with anger, then sadness and again anger. Zero respect for the traditions and kindness of Alaskans, and it looks like our own Alaska Senator Begich has stepped up to defend her. Take a look at McCarthy’s record on carbon credits, Keystone Pipeline stance, etc., and you’ll get a good look at someone that is thwarting American resource development and energy independence. This is another reason we want the Federal government to STAY OUT OF OUR BUSINESS! I can only venture to guess that Ms. McCarthy has absolutely no clue as to the amount of work that went into that life-sustaining jar of moose meat. There was the planning and preparation for the hunt. There was the time invested in the hunt itself with no guarantee that it would be successful. Finally, if the hunter is successful, the meat must be properly field-dressed and then cured, canned, or frozen in order to preserve it so that the meat is safe to eat. A lot of work went into that gift of canned moose meat! Would it have really been that difficult to simply say “thank you”? Was it necessary for a government official on a taxpayer funded trip to drop the F-bomb? Somewhere along the way, Ms. McCarthy missed the important lesson of “do unto others”. Is it really too much to expect R-E-S-P-E-C-T from public servants? Apparently so. WASILLA — You can fill a small library with the books that have been written about former Wasilla mayor, Alaska governor and 2008 vice presidential candidate Sarah Palin. Some were penned by journalists, others by friends. Some were produced by business colleagues and some by Palin herself. So what sets apart a new book written by her father, Chuck Heath Sr., and her brother, Chuck Heath Jr.? Originally, Chuck Heath Jr. wanted to write a book about his gold mining and hunting experiences. Chuck Heath Sr. said his son has kept a journal for years, so the idea was to write about his experiences in Alaska. But after thinking about it, they decided to write a book about Sarah. Chuck Heath Jr. wanted to show people the real Sarah: what formulated her philosophies, what gave her a strong work ethic and her perseverance. When they first approached Sarah with the book idea, she said she didn’t care to be involved, he said. For the Palin and Heath families, the book serves as kind of a historical road map to where they are now and where they came from. But also as important, Heath Sr. said, is that it be seen as the real story. Heath Sr. said the writer had her playing against teams like East High and Service High in the state finals and he made up names for the other team’s members, and they were all Eskimo names. He said the writer also had Todd winning the Iron Horse Snowmachine Race. The Heaths say they aren’t out to change anyone’s opinion of their daughter and sister. People have already made up their minds about Sarah, Heath Sr. said. 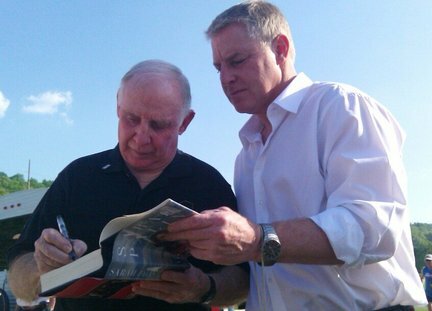 For both Heaths, writing the book was a learning experience, especially for Heath Sr. He said he came away knowing his son a bit better, too. He also said he really enjoyed writing and relating the parts that talk about the trips the family went on. Common sense conservatives have been joined together by common principles, among which are a respect for life, love of country, commitment to the Constitution, and belief in fiscal restraint. Those of us who support Governor Palin have found ourselves united also by a determination to defend her record and character against the onslaught of personal attacks, false narratives, and outright lies. Since 2008, a core of supporters have fought back against every attempt to trivialize her influence and remove her from the forefront of American political life. Many have risen to the occasion to set the record straight. Citizen journalists have led the charge, debunking fiction while disseminating fact. Chuck Heath, Sr. and Chuck Heath, Jr. have given us something that will help in our goal to spread the truth of who Governor Palin really is. The Governor’s father and brother wrote Our Sarah: Made in Alaska, a book that allows us to better understand her upbringing, her work ethic, and her political career. They share the adventures of an ordinary family whose life experiences helped produce someone doing extraordinary things. Our Sarah serves, not only as an entertaining account of a family forging their way in the Last Frontier, but as a tool to aid in putting the truth front and center. Unfortunately, haters are hell-bent on hating, a fact which is not likely to change. They not only take to social media like Twitter and Facebook to spew their vile, or write books citing unnamed sources to cast aspersions, they go about seeking ways to override every vestige of positive news about Governor Palin. Since the Heaths released their book, some have written reviews of it for the purpose of continuing their anti-Palin campaign. I read the entire book in one sitting and wanted more. This book is not just setting the record straight, but has great Alaskan stories that bring home why Alaska is called ” The Last Frontier”. Sarah’s brother, and dad especially seem to be characters, the type of folks that you could sit and listen to tell stories for hours. I laughed out loud at some of these stories and was touched by others. Really, a well-written book- the only downside that it wasn’t longer. With down home folksiness that epitomizes the parents of Governor Palin , Chuck Heath tells the story of an incredible state ; an unforgettable family and a remarkable daughter—Governor Sarah Palin. The only review on Barnes & Noble is the one I submitted. We need more of these positive, truthful comments to push back against the negative ones. In the interest of our ongoing effort to fight the smears and right the wrongs, would you consider going to these sites, signing up, and posting your comments about Our Sarah: Made in Alaska? You can also rate the book. I’ve heard many people praise this new book, and it’s enjoying success on Amazon.com. Let’s not just read the book, go to our favorite website, and talk amongst “our own,” however. Won’t you consider leaving your mark for all to see? This is yet another way to help Governor Palin and to stand up for the truth. The critics, most of whom, I’d venture to say, have not even read the book, are counting on us to remain silent while they loudly proclaim falsehoods and discourage others from reading the true account of Governor Palin’s life and character. Let’s meet them where they are. Please go to the Our Sarah: Made in Alaska page at Amazon, Barnes & Noble, Goodreads, and any other place you find that allows a comment or review. I’ve already done the same. Standing up for Governor Palin is what we do, and this is just another way to accomplish that. Our work continues. Can the Palins and Heaths count on you? The Our Sarah book tour received complimentary coverage as father and son, Chuck Heath, Sr. and Chuck, Jr., returned to a place where they have deep roots: Idaho. 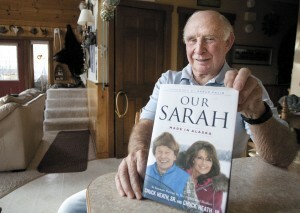 “Because I like Sarah Palin,” the Coeur d’Alene woman said, holding two copies of the $24.99 hardback written by Chuck Heath Sr. and Chuck Heath Jr.
White bought one for herself and one for a friend, and had both autographed by Sarah’s dad and brother. “They’re down-to-earth people,” she said. About 50 folks gathered at the Hastings store on Best Avenue to hear from the Heaths during one of their stops on a nationwide book tour. They laughed often – “Anybody that calls me Mr. Palin, I charge them a dollar. I could be rich on that,” Heath Sr. said, grinning. But they also often expressed frustration with the media they accused of twisting words and making up stories about Sarah Palin and her family. “Most of the stuff written about us is totally untrue,” Chuck Jr. said. “You guys that know her personally, she is as regular as anybody you will ever meet,” he added. He said he also doesn’t know his daughter’s game plan. “We don’t know what she’s going to do tomorrow. She’s very unpredictable. You’ll be seeing her again, I guarantee that,” he said. He said Sarah only cares about what’s best for the people. 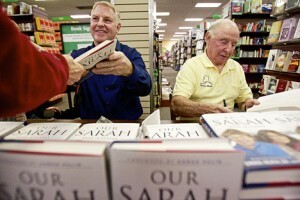 Shirley Greene drove up from Moscow to meet the Heath men and buy the book because she, too, is a huge Sarah Palin fan. She said Chuck Heath’s mother, Marie, was her teacher in Hope. 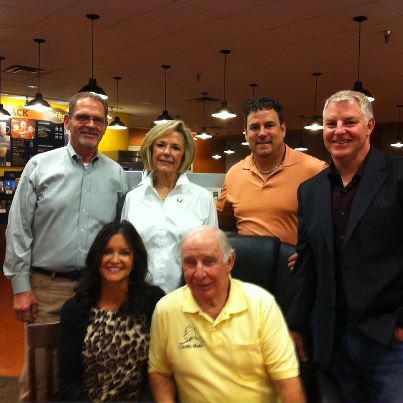 Palin: Thank you to everyone who has supported my dad and my brother on their book tour! Several books and articles have been written, and some movies made, under the guise of sharing with the public who the Palins are, and who I am in particular. Very often, the goal is simply to misrepresent us and present something so far-fetched as to not bear any resemblance to truth at all. Many in the media have been more than happy to make room for these stories and allow those behind them to have their say, though these “biographers” very often neither know me nor are willing to put names to their so-called sources. This is why I so appreciate those members of the media who are giving my dad and brother—who have written a factual book—a platform to tell the real story. Unlike many of the other books people have turned to for information, Our Sarah: Made in Alaska is written by two people who actually know me, were there through much of the 2008 campaign, and have cut through the bunk right to the truth—the truth of who the Heaths and Palins really are and what an Alaska upbringing provides. I am thankful for those who actually are fair and balanced in their reporting, giving the two Chucks the same opportunity to tell their story. Two particularly good interviews are one Chuck, Jr. did with the Great One, Mark Levin, and an interview Greta Van Susteren conducted with both Chucks. If you only saw what Greta was able to air on On the Record last night, be sure to watch the uncut version. A heartfelt “thank you” to those who have taken part in the book tour. In a whirlwind of a schedule, Dad and Chuck, Jr. have traveled to various states, and many of you have been there to greet them, help with laundry (yes, that’s right! ), or just shake their hands. I know they appreciate it, and I just wanted to chime in and say that I appreciate it also. The tour is winding down, but there are a few more stops. Go here to see the remaining schedule, and stop in to say “hello” if you can. You never know: you might just end up in one of my brother’s journal entries, which he’s recording on their Facebook page. In the Governor Sarah Palin Facebook posting copied below Governor Palin gives me a shout out. But, besides just a shout out, she also urges her followers to go to GretaWire and watch our entire interview with her father and brother about their new book. I likewise urge you to scroll back and watch the entire interview because there is more to the interview than what we aired on ON THE RECORD at 10pm on Friday. When we pre tape an interview as we did with her Father and Brother, I frequently take advantage of being with the guest (or guests) and interview longer than our planned airing time so that I can give you something extra here on GretaWire. By the way, Gov Palin’s father is fascinating! You would not believe his collection of artifacts at his house in Alaska. 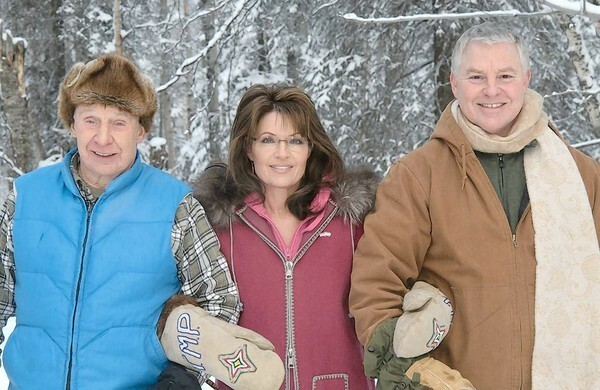 On one of my many trips to Alaska, Governor Palin’s Father and Mother gave me a tour of their home. Their house is a Museum of Natural History – a collection of items he has gathered over his years of exploring that giant state of Alaska. For years he was a teacher and in talking to him and seeing his collection of artifacts I know he was a great one. I learned a lot from him just by getting a tour of his home from him.